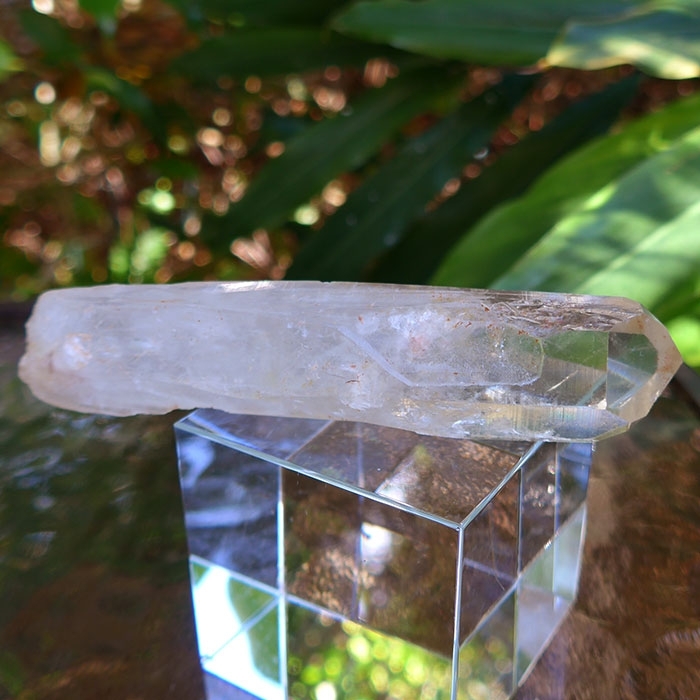 Dimensions (HxWxD): 4.85" x 1" x .85"
This stunning Ultra Clear Namibian Citrine Dow Wand, measuring 4.85" long and weighing 3.7 ounces, is quite transparent, with a slight lovely golden hue. Highly prized channeling wands contain a distinctive seven sided face opposite a triangular face. 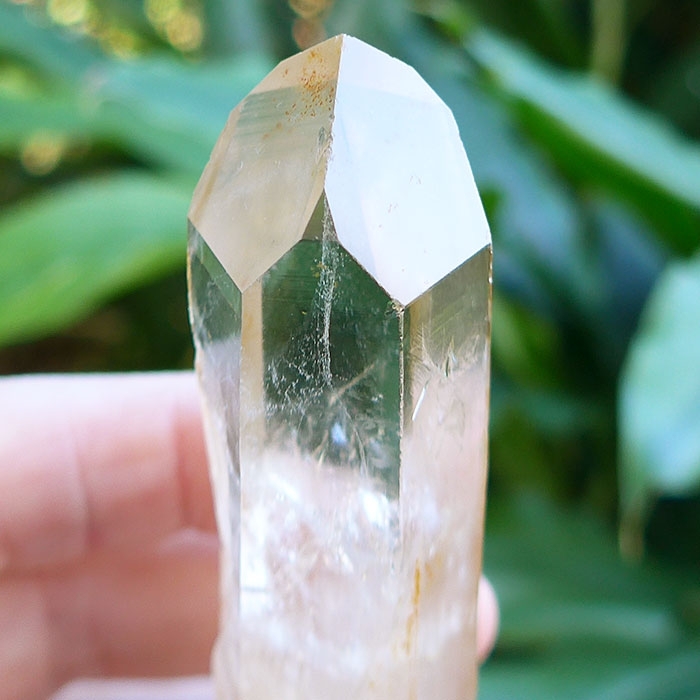 Lightworkers say that these crystals have a unique ability to connect the user to inner spiritual guidance, and to sources of Higher Wisdom in spiritual worlds, such as Spirit Guides, Angelic Presences and Spiritual Teachers. Rare Dow crystals are highly prized for their unique metaphysical properties. These extremely rare triple channeling wands exhibit three seven sided channeling faces separated by triangular faces. 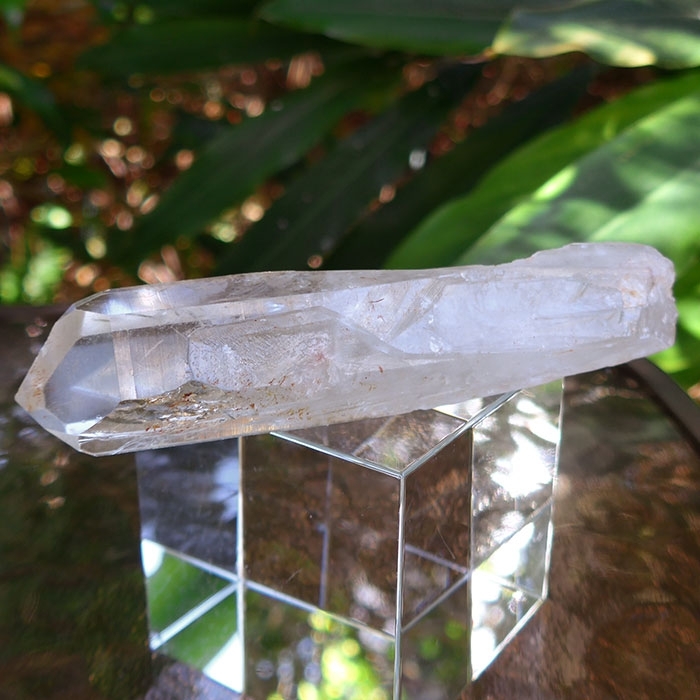 Dow channeling crystals have amplified abilities to connect the user to Higher Wisdom, Spirit Guides and Teachers and Angelic presences during meditation. In addition these Dow crystals have a remarkable ability to receive and transmit great amounts of energy over space and time. Citrine is a powerful semi-precious stone which is a rare, more powerful form of quartz crystal, characterized by a yellow color, ranging from white to deep copper. It is less common in nature than amethyst (another member of the quartz family, and one of the two semi-precious stones present in ametrine) but both are found in quartz veins, as well as volcanic locations and elsewhere in nature. Because citrine helps strengthen the aura, citrine is an excellent stone for clearing and cleansing body, mind, heart and aura, and helps to repel negative energy in the environment. A strong aura is your best protection against ambient negativity. Citrine's action on the third chakra is said to aid in digestion and to activate the thymus, which regulates our immune system, thus promoting health and well-being. In addition, citrine is said to provide a feeling of comfort and optimism. I must admit, that when I wear or work with citrine, I have a great sense of well being and protection. 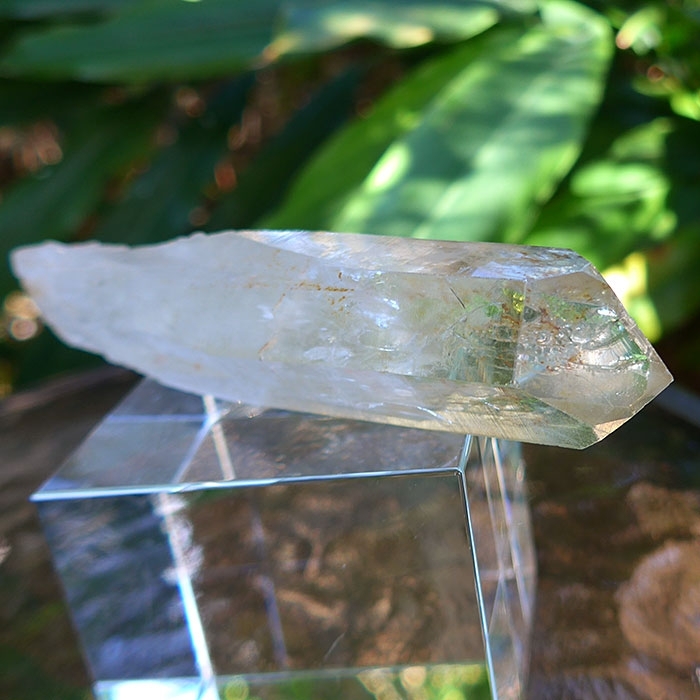 our experience, citrine cleanses the emotional and etheric bodies, and stimulates the holder’s vital energies and physical body. It imparts a strong sense of protection if worn on the body or placed in a room where energy work takes place or groups gather. 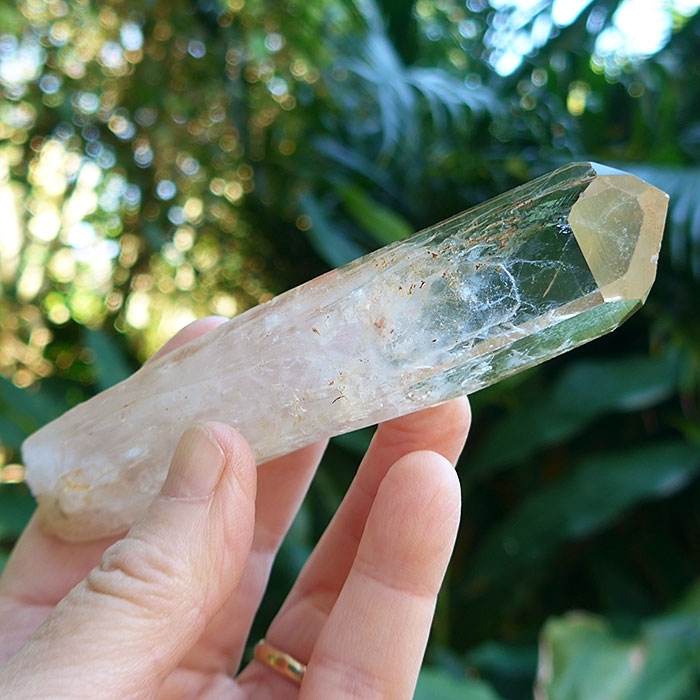 Used in energy healing, citrine is said to transmit the golden light of unity consciousness, which is tuned to the very highest vibrations of an open eighth chakra -- the chakra above the crown of the head, said to be the location of the Higher Self. 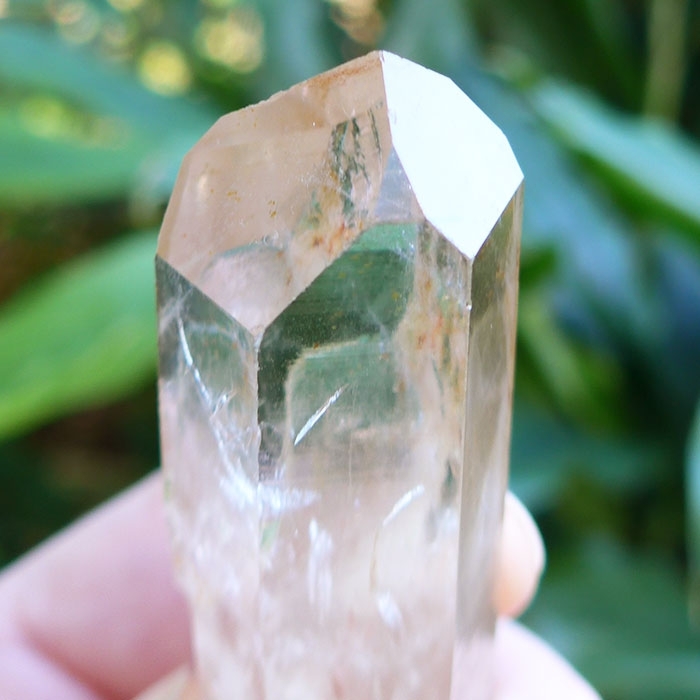 Used in meditation, citrine stimulates the seventh, crown chakra, our doorway to Cosmic Consciousness, and helps unite the seven chakras relating to the physical body with the energy frequency of the Higher Self, aligning the eighth chakra with the rest of the energy body. Above weight is shipping weight. Net weight is 106 grams or 3.7 ounces.